One year and two weeks ago, Newsweek’s McKay Coppins sat down with Jon Huntsman to talk about his future. He’d quit Republican politics to become Barack Obama’s ambassador to China. He was counted out completely from the 2012 race. And now here he was, talking about “one final run” for president as advisers talked up his chances. Coppins analyzed the “Manchurian candidate’s” chances. 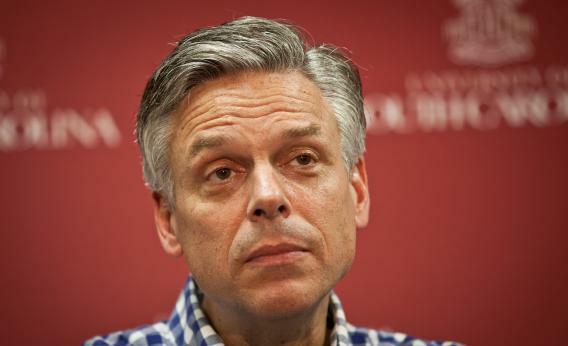 The cable-news crowd will undoubtedly scoff at Huntsman’s prospects in a Republican primary. After a right-wing resurgence flooded Congress with Tea Party Republicans, the field doesn’t appear particularly inviting to a moderate Obama appointee. But an increasingly vocal segment of the GOP is worried that the conservative populism of 2010 is distracting the party from its more pressing priorities. “We may be confusing a clearing in the forest for being out of the woods,” says Republican strategist John Weaver. Within months Huntsman had left the Obama administration, and John Weaver was running his campaign. They would prove Weaver and his fellow-thinkers right: Someone could save the GOP from itself. Or not. Jon Huntsman’s presidential bid will end tomorrow in Myrtle Beach, S.C., according to a campaign source; according to Maggie Haberman and others, the candidate will endorse Mitt Romney as he strolls toward the exits. What happened? The early wisdom was actually right. Divided as they are, ready as they are to let Mitt Romney win the nomination anyway, Republicans in 2012 had no interest in a compromise candidate who could speak Democratic parseltongue. If it had worked, the Huntsman game plan would have gone like this. 2) Win over Democrats and moderates with attitude and boutique issues, and win New Hampshire’s open primary. Huntsman actually pulled that off. Before the New Hampshire primary, a campaign source sketched out a map of how the electorate should look if the candidate was doing well. Fifty percent of voters would be independents and disaffected Democrats. Thirty percent would be conservative Republicans. Twenty percent would be moderate Republicans. This ended up being mostly right, and Huntsman won 40 percent of Democrats who’d voted in the GOP race. But he still came in third overall. What went wrong? It wasn’t just Republicans who were angry. Pissed-off independents and liberals heard even stronger attacks on the GOP from Ron Paul, and too many stuck with him. 3) Win the other primaries. Even now, I have no idea how this was supposed to work. Once the race moved on from New Hampshire, Huntsman was going to compete in races full of Republicans, light on independents, defined by Tea Partiers and social conservative. The only primary Huntsman won: The media’s. Slate’s own Jacob Weisberg profiled Huntsman for Vogue. The New Yorker published one of many pieces about Huntsman’s strategically silly daughters. New York gave Huntsman a co-cover with Mitt Romney, playing up their personal tensions, stapling a margin of error candidate to the campaign narrative. Morning Joe practically added Huntsman to the cast. The way that the modern GOP base thinks, this was yet more proof that Huntsman couldn’t be trusted—no one profiled by Vogue could be worth a damn. And now he’s out. The sorts of voters who liked Huntsman: Moderates who will naturally move to Romney, Democrats and liberals who can feel better about their Ron Paul protest votes. The number of voters who fit this profile moving forward: minimal. Which was always the problem. You work with the party you have, not with the party you may wish you had.